The Sea Tel 9711 IMA (Integrated Maritime Antenna) System combines a C-band circular/linear Switchable Feed as well as a Ku-band cross/co pol switchable feed with sub-reflector. The combination allows switching from C-band operation to Ku-band operation electronically and eliminates the need to manually change the feed. The Ku-band sub-reflector has been designed to optimize the RF performance of the 2.4 meter antenna. This patented state-of the-art design is second to none when it comes to RF performance. 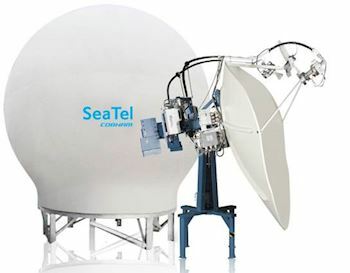 The Sea Tel 9711 IMA features a 2.4-meter radical offset antenna for both the C-band and Ku-band operation. This offset design provides the most efficient 2.4-meter antenna in the market today. Software has been specially designed to switch from C to Ku-band operation in a matter of seconds. By eliminating the need to manually change feeds when switching between bands, the Sea Tel 9711 IMA is incredibly cost effective. A technician is no longer required to be dispatched for making configuration changes, eliminating offline time for a vessel while switching between networks. The Sea Tel 9711 IMA system is fully compatible with ABS technology. By combining multiple option files in a single modem, the user can make near seamless transitions from C band circular A Pol to B Pol, C-band linear, and Ku-band satellites. The web user interface, accessible from practically any internet enabled device, including mobile devices, features Secured Socket Layer (SSL) password protection and multi-level data analysis capability for ease of use and added security. The Sea Tel 9711 IMA systems with C/Ku switchable feeds are the cutting edge, top-of-the-line solutions for your top performance maritime communication needs. There are currently no additional images for this product.